In order to ensure the stability of the data, an energy barrier that separates the information from the non-information is required. In order to prove that the data is still legible after millions of years, an ageing test is required to see if the energy barriers are high enough to prevent data loss. De Vries: "According to the Arrhenius model, the medium should keep working for at least 1 million years if it is heated to a temperature of 473 Kelvin (200 degrees Celsius) and kept in the oven for an hour." After the test there was no visible degradation of the tungsten, and it was still easy to read the information. Things become complicated at higher temperatures. 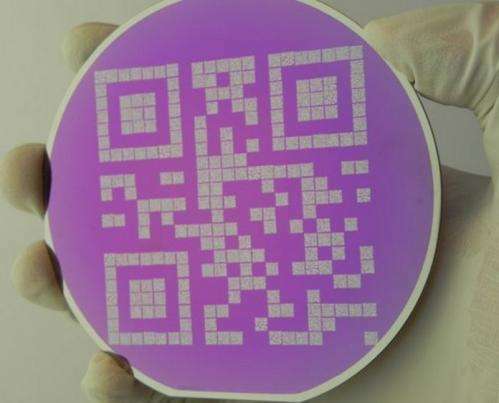 When heated to 713 Kelvin (440 degrees Celsius) it becomes a lot more difficult to decypher the QR codes even if the tungsten is not affected. De Vries: "A follow-up study would be to investigate whether the data carrier also can withstand higher temperatures, for example during a house fire. But if we can find a place that is very stable, such as a nuclear storage facility, then the disc itself and the data that is on it should be able to endure millions of years." How do aliens know the way to decode the QR code? While i love the idea of leaving behind a human legacy for the Universe to uncover should we meet an untimely demise -- I must ask myself - how do you safe guard it. How do you ensure it can give up the information it contains. How do you make sure its contents can be read. How do you make it so that a reptialian neanderthal who uses it for a brick in a hut won't destroy it? The irony of barbecuing the disk then going to the trouble to use rubber gloves to handle it in the lab is ... well ironic. Maybe it was to avoid smudges while looking at it with the microscope. If one can figure out how to store and code this info in a rugged but readable way, one place to put it would be in the bottom of "dry" oil exploration wells. Just drop a packet of the storage media in the bottom, fill with 100M of concrete and repeat to near the surface. If this is done for many such wells all over the world, then the chances of at least one of them being exposed by erosion at any one time and not melted or deformed by heat and pressure may be good. One way to make such discoveries even more likely would be to seed the covering concrete with gold or some other useful metal so as to make digging it out attractive. What is the density of the disc? I didn't see that. Protecting the information in a secure environment for a billion years is doable assuming no catastrophic asteroid impacts, super volcano explosions, or tectonic upheavals. And after a billion years, where are the instructions on where to find these disks? The instructions would be perishable and over the eons the information would certainly be lost. Even if the earth is void of life a passing alien craft would just see another rock in space, unaware of the treasure trove of humanity's history buried in a cavern somewhere. Maybe long-lived radioactive elements buried around the location in geometric patterns (100's or 1000's of miles away) could "point" to the location, with finer and finer patterns until it literally pinpoints the location. This should be detectable from any passing craft. My 2 cents. Why not figure out how to store information for 100 years first? Why store any information for future beings? Let them recreate Here Comes Honey Boo Boo on their own. Lazy SOBs. Maybe I'm seeing a little bit of a presumption that whoever discovers this media has a more stable culture than we are guessing ours is. Otherwise: some millions of years in the future it will be discovered, it will be known for a few hundred (or thousand) years, then forgotten/destroyed. Permanent data storage is nice but useless without doing the same thing to the reader. You also need a permanent encryption key to the data storage code that can be read without a reader in case only the data survives. And this doesn't even take into account a language that may not exist anymore. Stone pyramids and monuments, while not able to hold as much information, are still far superior at storing data than our technological means. 5 kiloyears (possibly much, much longer) and still going. If the point is to pass along information to another intelligence in the far future, I would think about doing something like that instead. The meaning of words is arbitrary in the absence of context. Therefore you use pictures, dictionaries, thesaurus, and diagrams in order to convey the meanings of the words. This is probably why Hieroglyphics was the common written language in ancient Egypt. It's a language which uses pictures and pictograms to communicate information. You don't always need to know the language to know the meaning of a picture. The word "Cat" is a symbol for the concept of a Cat, which is itself a generalization of an actual Cat. The meaning of the word "Cat" certainly is not found nor determined via the sum of it's parts. It is a label which means something entirely different from it's parts. So if you wanted to preserve knowledge for future generations, it is not sufficient to encode a text document. You need to save a "picture dictionary" and a "thesaurus", and preferably a grammar text or two. You are correct. Languages and Words lose meaning through time. The Word "cat" may change meaning, or disappear all together, and the same may be true of the word "Apple", but a picture of a cat will always be a cat, and a picture of an apple will always be an apple, regardless of how much the written or spoken language changes. Therefore a picture dictionary allows you to tie the meaning of words to absolutes: The picture of the person, place, animal, or thing. You can also use picture dictionaries to display the meaning of more complicated concepts than nouns, such as Verbs and prepositions. i.e. "run" or "swing" (at a ball), or under the table, or under water, both literally and financially, because figurative speech is the hardest of all to understand without context.